Tomato Cornmeal Tarte Tatin: Maybe. Eventually. 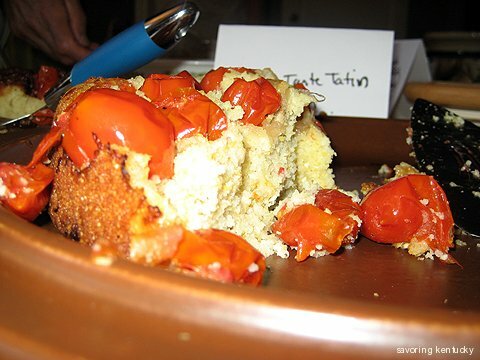 Back in the sweet days when it seemed we could not figure out what to do with all the tomato wealth (in other words, before it got lethally hot and stopped raining in the Bluegrass), I used the occasion of Cornbread Supper -- when hungry people will try just about anything -- to experiment. I tried making something I'd never heard of -- a Tomato Cornmeal Tarte Tatin. It may be that my cast iron skillets whispered in my ear. I still remember how amazed I was to learn that a quintessential French dessert, an upside-down affair of caramelized fruit and puff pastry, classically cooks in black cast iron skillets, the same humble pans that produce daily cornbread for working/cooking Kentucky farm families. I have tried making apple tarte tatin, with modest success, and I always meant to work on it more. From this Smitten Kitchen post, I gather there are quite a few tricks one learns through practice. I discovered from the great cyber-cookbook in the sky that others have tried tomato tarte tatins, and have had success (after practice.) I could not find any examples of cornbread or cornmeal tarte tatin - and for good reason, I'm sure. Replacing a puff pastry with cornbread makes quite a change in a classic recipe. I don't hold it against the French that they haven't invented a Tomato Cornmeal Tarte Tatin just yet. I'm assuming they would have, and it would be très parfait by now, if only the same great sweet corn that grows in Kentucky grew in French farms and gardens, tool. So here's what happened. I tried two different approaches. I caramelized 1/2 cup sugar in each of two cast iron skillets. In one I packed in whole, petite San Genovese plum tomatoes. In the second I added slivered fresh onion, rosemary, and mixed smallish, halved heirloom tomatoes (stripey ones, Green Zebra, small yellow, reds, and pinks). I wanted to contrast a savory approach with a purely sweet approach. After some frantic bubbly boiling of the fresh ingredients in the blazingly hot caramel syrup, I topped each skillet with a standard Kentucky hot water cornbread batter, made with Weisenberger's unbolted white corn meal, and popped the skillets into a hot oven. The surprise? The contrast between the two tartes was more about the tomato types than about the savory add-ins. The San Genovese tomatoes stayed more intact and did not make a lot of extra juice to mix in with the caramel in the skillet during baking. The heirloom tomatoes went a little too far toward blackened for my taste -- my oven was too hot -- but released enough juice to make a lovely caramel-y sweet tomato-y layer. Both tartes received raves from eaters, but the heirloom tarte's raves seemed more fervent. My own take is that a Tomato Cornmeal Tarte Tatin is worth working toward. Tomatoes and corn are such good friends. My plans are to lean toward the smallish, both-juicy-and-meaty heirloom types for the tomatoes, and then make several recipe changes. First, I think 2/3 cup caramelized sugar would be better than 1/2 cup in my large skillets. Second, I plan to bake the tartes at 400 degrees Fahrenheit instead of the 450 I used the first time, and typically use for cornbreads. Third, I intend to tweak the cornbread batter to make it a bit more moist. Secret ingredient: 3/4 cup homemade cottage cheese -- a topic for another day, but I will say I use a buttermilk culture, while others use either a powdered culture, vinegar, lemon juice, rennet, or some combination of all these options. Finally, I think lots of experimenting with add-ins must happen. One of the first candidates: whole fresh sweet corn kernels, added just before pouring on the batter. Vive le maïs. The world is coming to visit central Kentucky this year for the Alltech FEI World Equestrian Games. To help our visitors know more about Kentucky's food and food ways, Savoring Kentucky is rolling out 116 Savory Kentucky Bites, one for each of the 100 days before WEG begins, and 16 for the days during WEG, September 25 - October 10. Today's Savory Bite is number 84. Weisenberger Mills - Now "Kentucky Proud"